Controversial journalist, Kemi Olunloyo has shared more details to buttress her claim that Linda Ikeji is not pregnant. This is coming hours after Linda shared pictures of her her uncovered baby bump prove the doubting Thomas wrong. 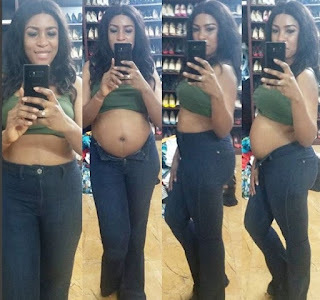 In a new video shared by Kemi Olunloyo, she revealed that what Linda Ikeji flaunted is called Moonbump which can be bought. She further claimed that she has details of the receipt Linda got from purchasing hers and that all the information was gotten from a certain Mary Ann who is a friend to Laura, perhaps Linda’s sister.